It’s a rare occurrence when a book comes along that not only teaches a lesson and gives children something to truly enjoy, but also fills the heart with love. This is that book. The illustrations are adorable and the words are kind, loving and filled with emotion. [T]his reviewer believes Ralphie is a book that moves from the category of lovely to award-winning. 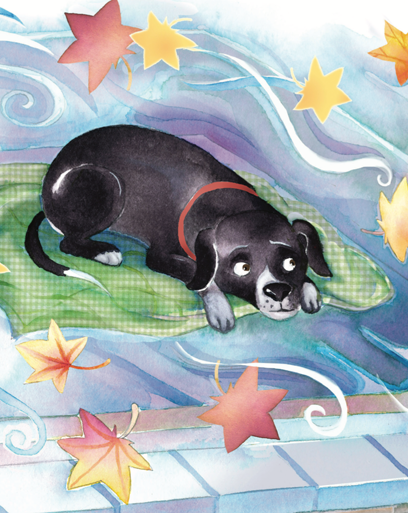 It is a fact that the love, respect, admiration, and kindness dogs bring to our lives is something that goes beyond the norm; they are truly a gift from Heaven, and this author/illustrator team has put on paper what dog owners everywhere feel with all their hearts. Quill says: You need to jump on board with the many other passengers out there who, I am quite sure, have already fallen absolutely in love with Ralphie! Andrea writes from her own life experience and enormous heart. Ralphie offers an opportunity for young readers to make multiple connections with themselves and other books they have read. Any child who doesn’t have a dog will want one after reading this sweet book! A heartwarming tale of love, patience, wisdom, and the circle of life. It takes patience to love a puppy and wisdom to say goodbye to an old dog with grace. I was honored to know Ralphie and the author and heartened to see another aspect of their lives. This is a story for those who have loved and have been loved in return. It is a tale that teaches us when a dear friend passes on; there is unending inspiration and love left behind. Written in simplistic, beautiful prose accompanied by heartwarming illustrations, this story welcomes you in to experience the love of this family, as it grows to include their beloved pup Ralphie. Ralphie Always Loved illuminates a difficult topic for children in a way that consoles, enlightens, and mends your heart like nothing else could. A rare and valuable book for teachers and parents alike! Andrea Yerramilli is a former marketing professional who is a mom to kids – both with and without fur. She has an abiding commitment to finding the good in everything and believes that the sense of belonging to someone’s heart is what makes us feel complete; that kindness goes a long way; and that when things happen that you don’t understand, keeping your mind and heart open can help.